I hope that everyone had a wonderful Thanksgiving! Now it is time to really concentrate on Christmas. In order to help you, I am offering a Black Friday Through Cyber Monday Special. Here are 2 ways to receive a special treat from me! 1. Join in the Black Friday Through Cyber Monday Party on my website. Spend $50 on product to help you make those Holiday Cards and Projects and not only will you be eligible to purchase the Stamp of the Month for $5.00, I'll send you any "B" size stamp set of your choice. 2. Join in the .Black Friday Through Cyber Monday Party on my website. Spend $100 on product and not only will you be eligible to purchase the Stamp of the Month for $5, but you will also be eligible for a free starred product in the Holiday's From The Heart Gift Guide. And, you treat will be any "C" sized stamp set from me. In both cases to be eligible for the stamp set from me, you must join the "Black Friday Through Cyber Monday party on my website. 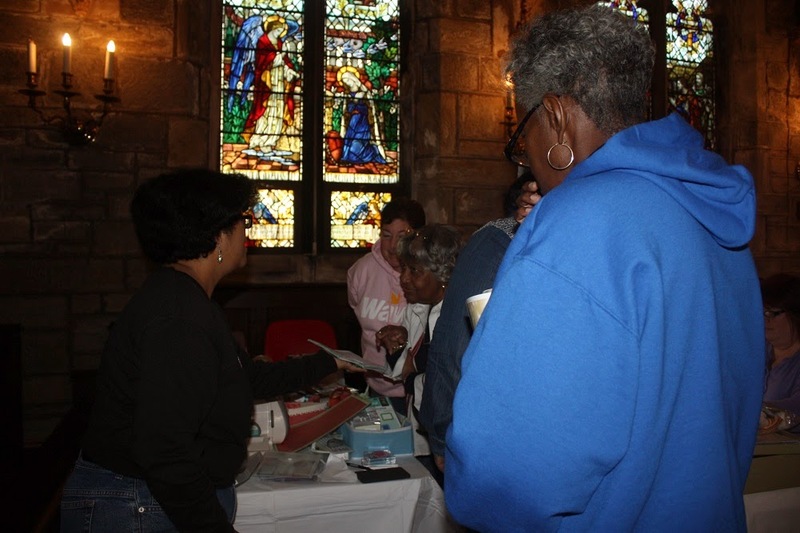 You need to also email me you choice of stamp set. 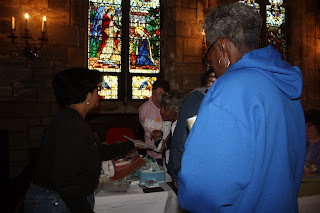 I will order your stamp set and mail it out to you as soon as I receive it. How cool is that! For Now, Happy Crafting! I am finally seeing my way clear to assume some of my Crafting By Designs designer team responsibilities. 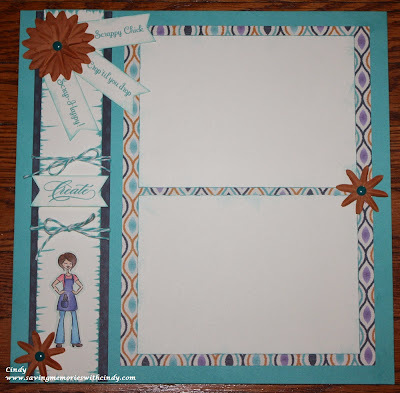 Whew.... Crafting By Designs is a terrific challenge blog that focuses on creativity and friendship. The challenges run for a week and many times have a great give away attached. This weeks challenge is to create a card that features either a Christmas or Winter Theme. 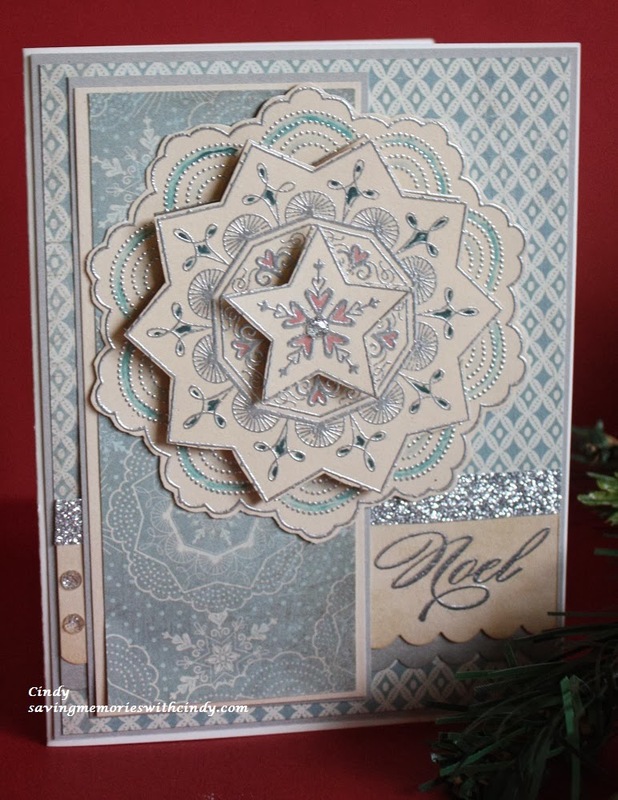 My card for the challenge features the CTMH stamp called Classy Doily (B1424) and the Frosted paper packet (X7175B.) 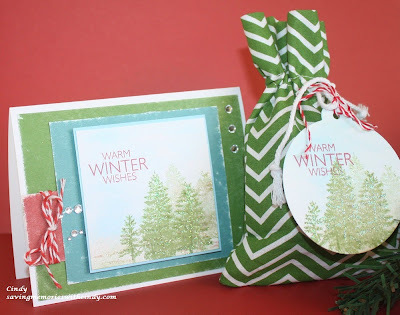 Both of these products are 2 of my favorites from the Fall/Winter Idea Book. To complete this card, I heat embossed the Classic Doily 3 times in silver embossing powder. I cut out the first image, then cut the second one around an inner design and the third I cut out the center star. I lightly colored small sections of each with my CTMH alcohol markers for just an accent and the focal image was done. "Noel" was also heat embossed in silver. The two bottom strips were punched using my CTMH border punch (Z1851.) 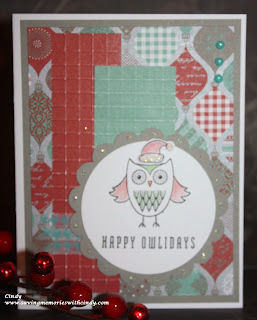 A few sparkles, a little shimmer tape and the card was done. By the way, the sketch is from "Make It From The Heart, Vol. 1." (9035) I love the CTMH sketch and how to books. 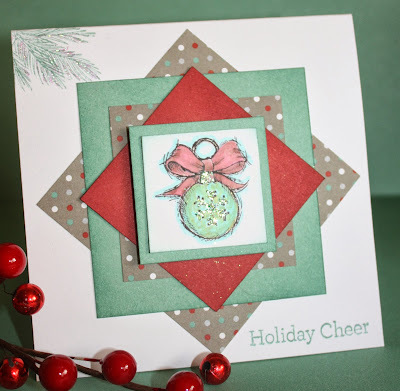 So, if you want to take a break from your cooking, baking and eating, hop over to the Crafting By Designs Blog Challenge and share one of your creations. For Now, Happy Crafting! Today I worked some time to begin to organize just how many Christmas Cards I have made and much to my dismay, I don't have enough made yet! AHHHH.... So, I began to think about a quick card that I could design and mass produce. Close To My Heart makes it so simple to make cards quickly but that still have a special flair. After all, the CTMH motto is "faster, simpler, easier." 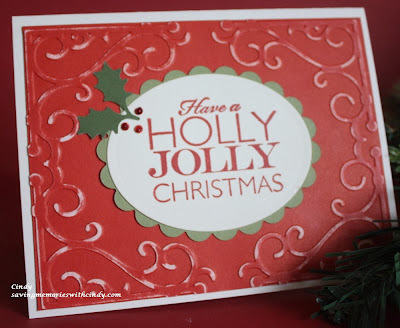 I dry embossed Cranberry card stock and then sanded it to remove color from the raised area. I love that CTMH card stock is white core....just another fun design dimension that can be added to any of your projects. The sentiment is, once again, from that terrific Frosted WTOG stamp set. It has become my go to stamp this season. I was able to create 6 cards in no time! 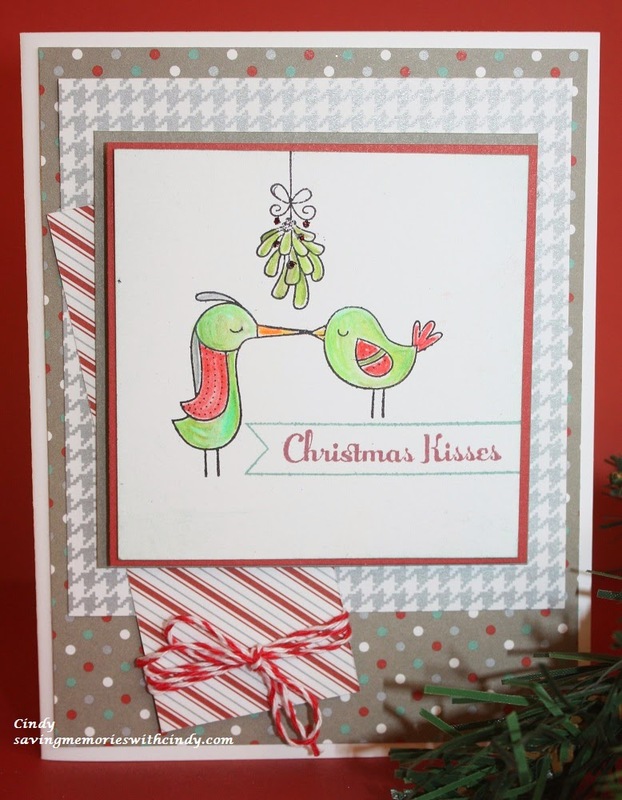 Whew... CTMH is the answer to Holiday card making projects. For Now, Happy Crafting! Well, it's back to work on my Christmas Cards and CTMH makes it so easy. There are so many wonderful stamp sets and papers and it is hard to decide what I want to make. 1. The White Daisy mat was cut to 3 x 2 inches. Take a small circle of scrap paper for the moon and roughly tear scrap paper to produce the sky. 2. Position the scrap circle in the upper left hand corner and do not move it. Take the torn paper and position it close to the top. Sponge toward the top with Sky Ink. 3. Move the torn paper down about 1/4 of an inch and sponge again. Remember NOT to move the circle. 4. Continue this step until you've sponged the entire piece of paper in Sky. The variations in the sponging will create the "cloud" look to the sky in your scene. 5. 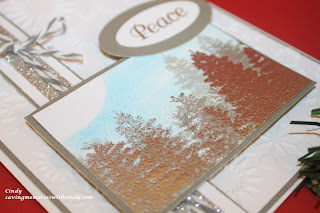 Using Whisper Ink, stamp the trees across the bottom of the card. You will have to stamp twice to complete your "forest." 6. Using VersaMark, repeat this step over the trees that you have stamped with Whisper. Vary the height of the trees from those already stamped. 7. Using Silver Embossing Powder, heat emboss the VersaMark trees. A little more about this card... 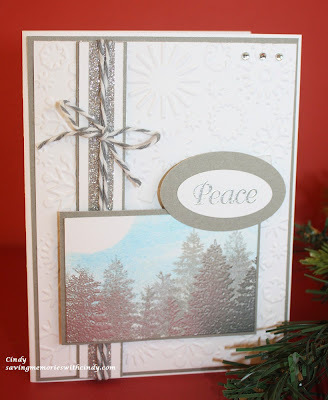 I used a White Daisy Card Base and the Gray Sparkle paper from the Sparkle and Shine paper packet. The larger White Daisy Mat was dry embossed using an embossing folder and "Peace" was embossed in Silver. It is from the October STOM. I "grounded" the scene with the strip of Gray, White Daisy, Silver Shimmer Tape and Gray Bakers Twine. It is not too late to make some wonderful Holiday Cards. The Frosted WTOG and CTMH tools make it so easy. BTW, we just learned that CTMH is retiring the heat embossing tools in February so, if you are in need of some of the supplies I mentioned here, or need heat embossing tools, visit my website to purchase them. For Now, Happy Crafting! 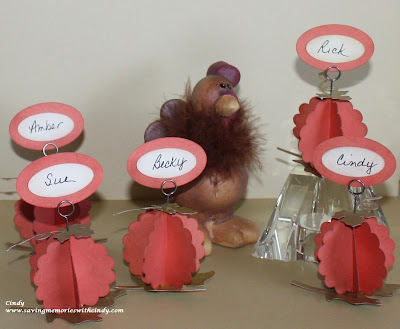 Right now, I have to admit, I've been focusing on my Christmas Projects; however, I did take some time this afternoon to make paper these cute place card holders for Thanksgiving Dinner. They were actually quite simple and worked up quickly, especially with the convenience of the Artiste Cartridge. I punched 6 2 inch scallop circles for each. They using the cartridge, I cut the base leaf and the leaf endorsement for the top. After sponging them, I folded each in half and using Liquid Glass I attached the 6 circles. Before I attached the last circle rounds together, I inserted a pin clip with the leaf stem inserted in the precut hole. I love these pin clips and am sad to say that they are currently for sale as "why supplies last" on my website. Anyway, I snipped off the bottom so that the pumpkin would sit flat and used Liquid Glass to attach it to the bigger leaf I cut. Easy! November 22, 1963 is a day that has been indelibly seared into my childhood memory. The day had started out as a typical day. I was a wee one, all of 5 years old, and had just gotten home from morning Kindergarten. Both my parents worked the 3 to 11 shift and my Grandmother lived with us. My Father had just left for work. My Mom was walking toward the back door to head out. My Grandmom was sitting in her usual chair. Bob and Lisa were having dinner on As The World Turns. I was playing in the Living Room. Then, everything stopped: Walter Cronkite broke into the soap opera, and with those fateful words told us that the course of history has just shattered... Shots had been fired at President Kennedy's Motorcade in Dallas. I can't image what went through my parents minds. There is my Father already on the road. My Mom was just about ready to leave...what does she do? Does she go to work, stay home? Were we safe? There were no cell phones, how do you reach your family? I know most businesses closed but I have no memory if she went to work, came home or if my Father came home early. What I do remember is the deep despair for the next several days. I remember the clip clop of the horses drawing the caisson. I remember the riderless horse. I remember Carolyn and John John at the Funeral (after all, they were MY age.) And, I remember Lee Harvey Oswald being shot on TV. 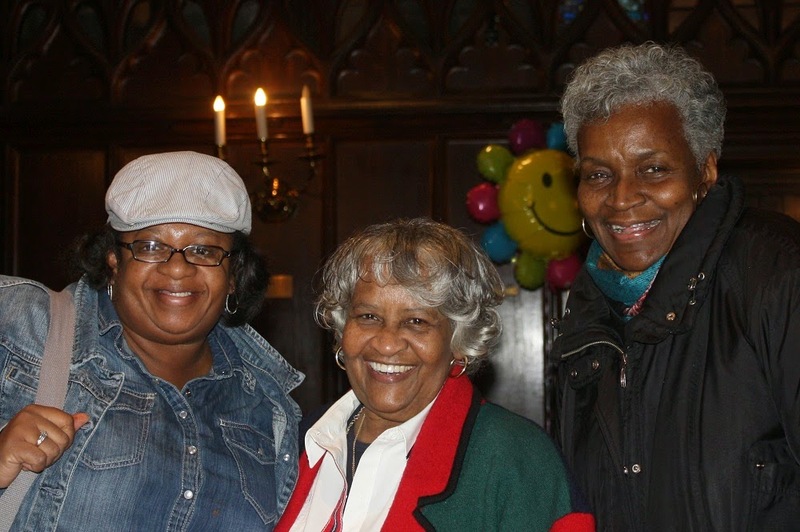 Every generation has a defining moment and for my cohorts...November 22, 1963 is that day. I have always been a JFK Assassination buff. I suppose that even though I was only 5, I was "smart" enough to realize that what I had been witness to an event that would have a lasting impact on my life. 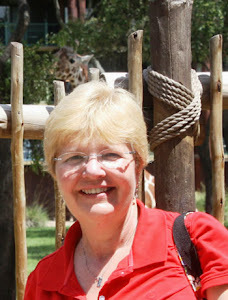 In June of 2012, the Close To My Heart Convention was held in Dallas. 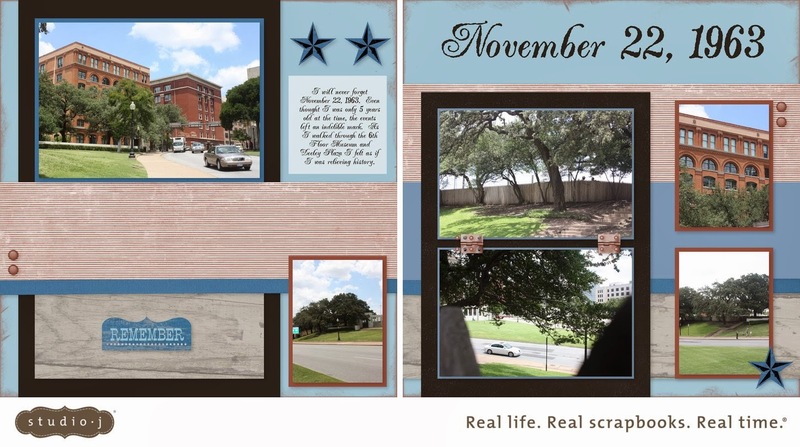 There was no way that I was going Dallas and not go to Dealey Plaza. I even left for Convention a day early just to find the time to visit the 6th Floor Museum and walk Elm and Houston Streets. This is a Studio J layout I completed shortly after I returned from Convention. Studio J is CTMH's online scrapbooking program and was perfect for something like this. I could easily and quickly complete the layout with the reverence the photos deserved. I find myself in a very odd mood today. I keep thinking of a young child watching her family's shock, knowing that something terrible had happened but just not being old enough to totally comprehend. I keep wondering how the world might have been different had JFK not been assassinated. My parents were Depression Era Children.. My Dad lied about his age and joined the Navy. My Mom, so wanted to be a Navy Nurse, but failed the physical so she volunteered at the Indianapolis IN USO. They had both helped to achieve victory in WWII. They identified with JFK. He was not a stogy typical politician...he was their generation. They had something in common. They were filled with hope for their 5 year old daughter. There was promise of a better world. With Kennedy in the White House paving the path for the future, their young daughter would not have to endure the tribulation that they had endured. But all that ended on November 22, 1963. What would have been different had JFK lived? Would we have dove head long into Vietnam? ...a decade that effected and still continues to effect us baby boomers. Would the Cold War have ended sooner? We will never know. I look back at the past 50 years and there have been collective sorrows: 9-11, the Challenger Disaster, the Gulf War. And yet, there have been monumental triumphs: Man walking on the Moon, the computer being commonplace, cell phones that are smarter and smaller than my first calculator. Who shot JFK? We will never know. But, today is a day, regardless of your age, to reflect on those sorrows and triumphs. And, to continue to ask not what can be done for us, but rather, what we can do for others to help make this a better world. 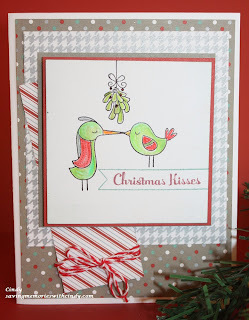 The CTMH Holiday's From The Heart Gift Guide has several great Holiday stamp sets. One such stamp is called Mary and Babe (C1562.) It is a beautifully drawn set that has 3 images, 2 Bible Verses and a sentiment. 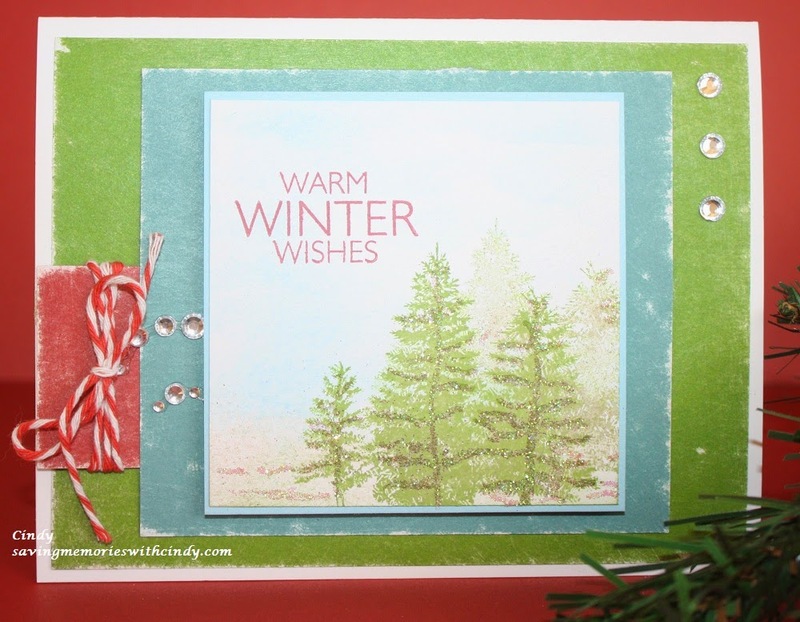 While it is a line stamp and could be colored, I wanted to try it using heat embossing instead. When I was thinking about how I should complete the card, I knew that I wanted to do something that was both simple and elegant. The first Cocoa mat is 5 3/8 x 4 1/8 inches. I then cut the Colonial White mat to 5 1/4 x 4 inches, cut it in half at the 2 inch mark and ran each piece through the Big Kick using 2 separate embossing folders. I hid the seam with the Cocoa and Colonial White strip. 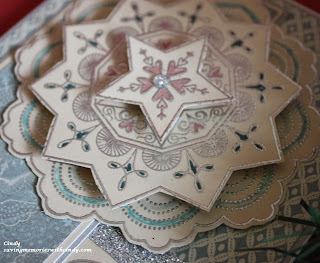 While the Big Kick was out, I used my Spellbinders to cut a small mat for the star. A little heat embossing and cutting out, a bow tied and the card was done. I always try to match the papers and layout to the style of the card. 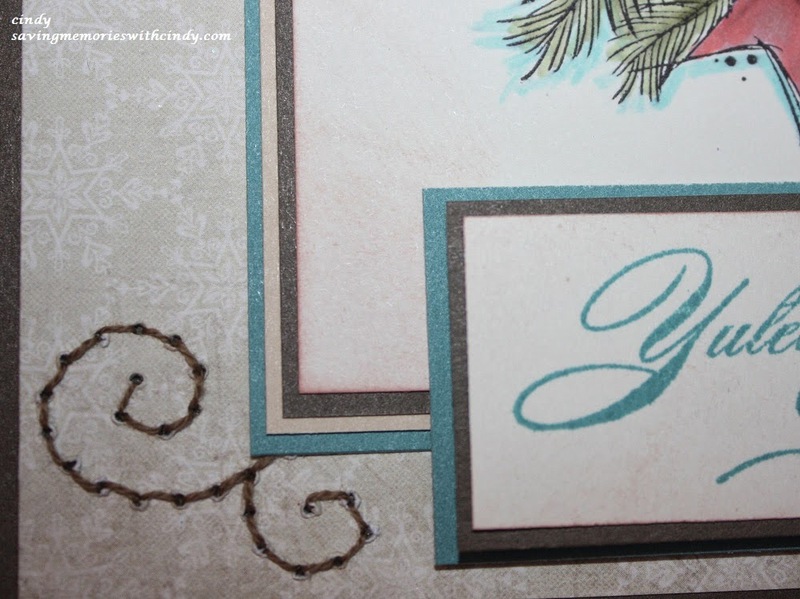 For this card, I wanted to do a stylish, elegant style befitting this beautiful stamp. For Now, Happy Crafting! A few weeks back, I got the new CTMH Stitch Guide (Z1852.) I have been anxious to try it since it was introduced at Convention and just hadn't had the time. Time, I found the time. All be it, I squashed it in between washing the kitchen curtains, windows and walls, raking leaves, designing a card class for my Michaels schedule and having my car inspected and walking home a mile instead of waiting for it to be done. Well, let me tell you, it didn't disappoint! 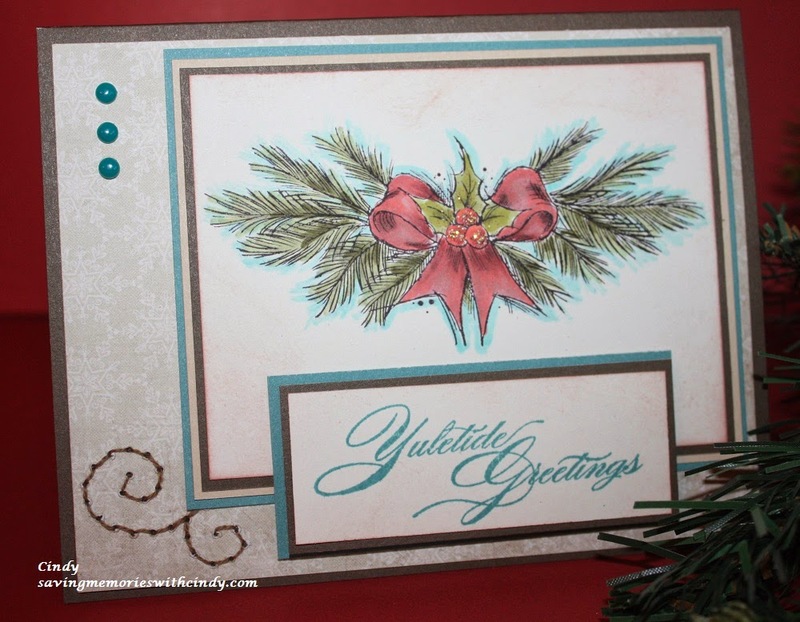 I used in to make a Christmas Card with Frosted (X7175B) and Yuletide Greetings (D1553.) Let me describe the stitch guide... It is a plastic ruler with multiple holes in patterns that you can use to pierce the paper and then stitch with embroidery floss or some sort of fiber. 1. If you are using embroidery floss, separate the individual threads...any more than 3 will tear the paper. Hemp and baker's twine are probably too thick. 2. Make sure you don't pierce the paper too close to the edge. 3. Keep your thread short. This will keep it from tangling as you stitch. 4. 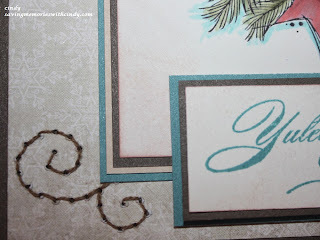 Hold the ends down with adhesive....Tombow or ATG work great. 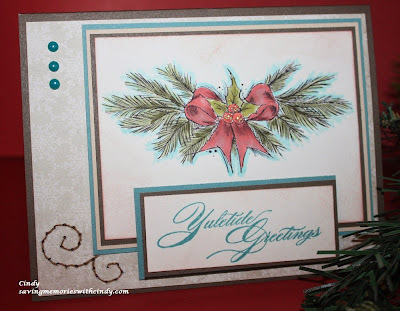 A few more fun things about this card...I used my CTMH Alcohol Markers and Black Archival Ink. And, the multiple layers of mats are cut only 1/8 of an inch instead of the customary 1/4 inch. This give just the hit of color. Even if you're not a sewer, don't be afraid to try the Stitch Guide. It is easy and adds yet another fun dimension to your scrapbooking and card making. You can see it on my website. For Now, Happy Crafting!. Because the bags are Topiary color, I used that shade of green as my base rather than the Juniper or Olive that coordinates with the Gift Bag Kit and Frosted. To create the background, I roughly tore stripes of paper. Because CTMH paper is white core, when you tear it, you have a layered edge. I sponged across the torn paper several times repositioning it each time to give the effect of clouds and ground. Also, because CTMH paper is white core, it sands beautifully. Sanding gives an aged distressed look. In this case, I sanded to give the effect of snow. Don't forget to check out the Holiday's From The Heart Gift Guide on my website. 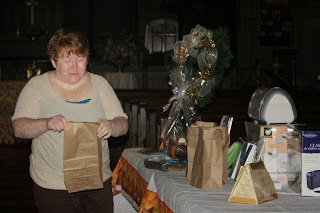 I think you are going to like all of the goodies! For Now, Happy Crafting! 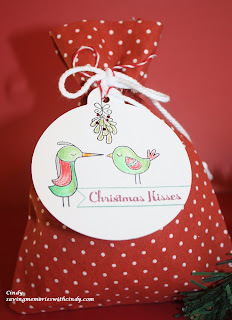 I just love the CTMH Holiday's From the Heart Season's Tweetings (Z1913) Gift Bag Set. 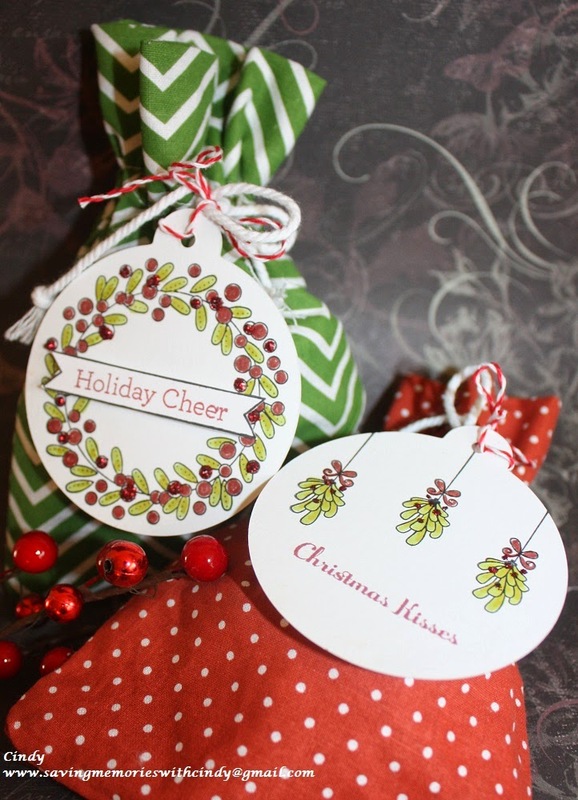 For $14.95, you receive 6 fabric gift bags, a B sized stamp set along with 9 tags. They are just too cute for words. We are using this set for our 4th Annual Holiday Workshop on Saturday. As I was preparing for class, I realized that it would be fun to include matching Christmas Cards with the gift bags. 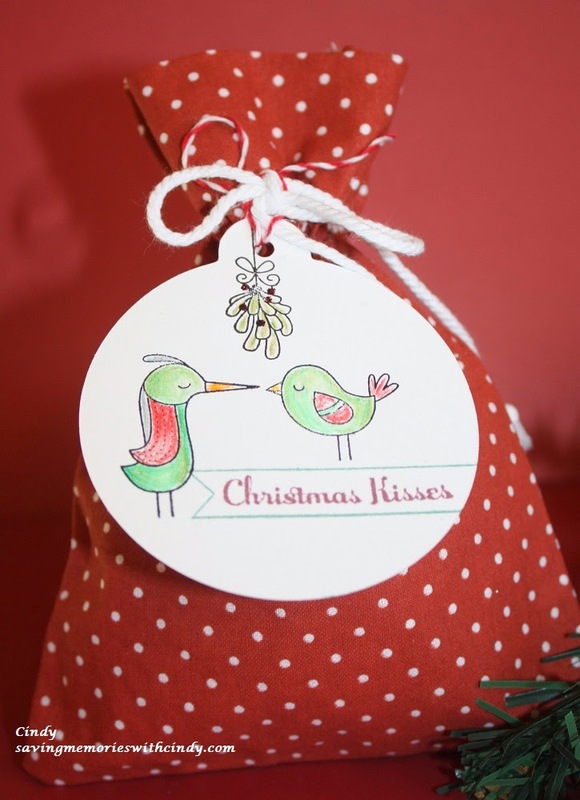 How cute is that to not only create a special wrapping for your gift, but also create a matching card! Both the card and the tag feature the images from the stamp set that is included in the Season's Tweeting kit. 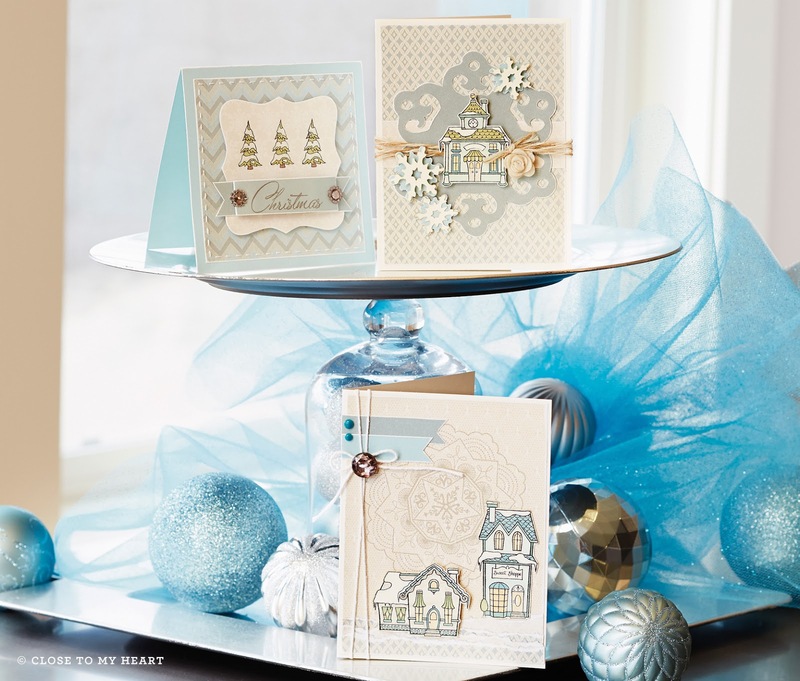 The card also features the Sparkle and Shine Paper Packet (X7176C) that is in the Gift Guide. 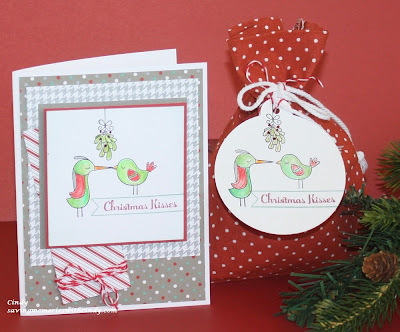 Here are both the card and gift bag so that you can get a better look at them. By the way, the birdies are colored using my water color pencils and a blending pen. I also wanted to share just another reason I love Close To My Heart. Each of the images are separate stamps. I used the banner stamp as a "booster" for the little bird so that she can reach the bigger bird. The sentiment is stamped inside the banner after it was stamped. Try doing all that with a wood mount stamp. heeheehee. Stop by my website to see the entire CTMH Holiday's From The Heart Gift Guide. For Now, Happy Crafting! 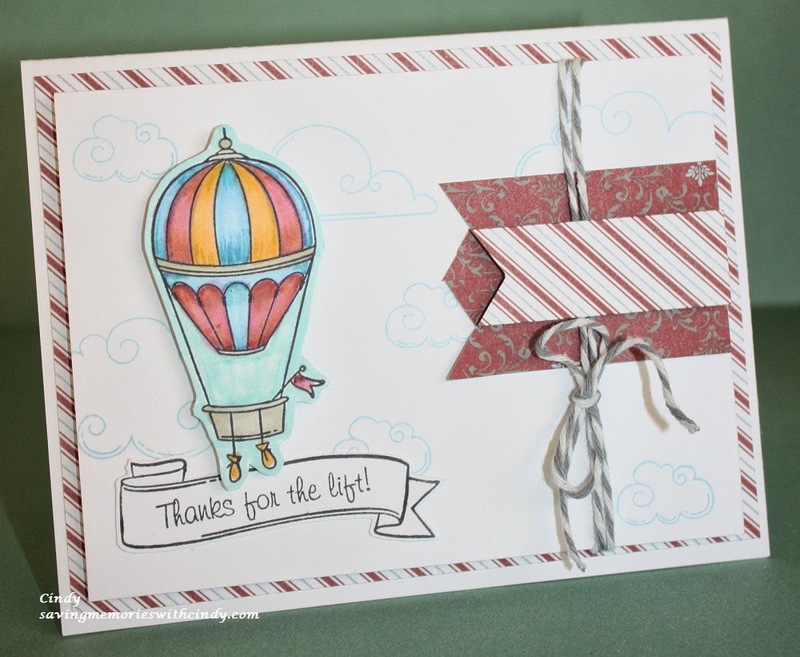 I stamped the balloon image using the CTMH Black Archival Ink (44751.) By the way, there has been a lot of chatter recently about using this ink with the markers. I want to tell you that I've never had a problem using the archival ink. The key is to allow it to set and dry in the paper. I let it dry at least 15 minutes before I begin coloring. That seems to be the key. When I plan on using the ink, I stamp my image and then prepare the remained of the card. When that is done, I go back and color my image. I have even used this ink with my Copics without a problem! Anyway, while my balloon was "setting," I randomly stamped the clouds in the background and cut my mats and banners. 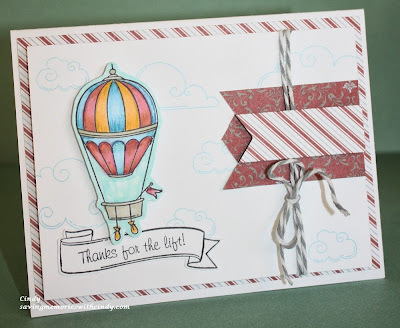 Once I colored the balloon, I cut it out and attached it to the card. Don't be afraid to use your Archival Black ink with your markers. Just make sure you let it dry and set first. 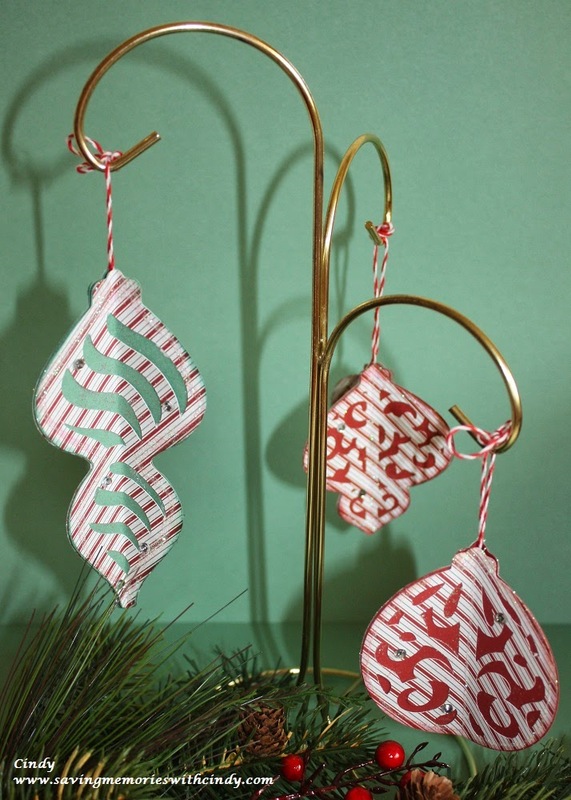 Also, don't forget to check out the CTMH Holidays From The Heart Gift Guide. It is not just for Christmas. For Now, Happy Crafting! 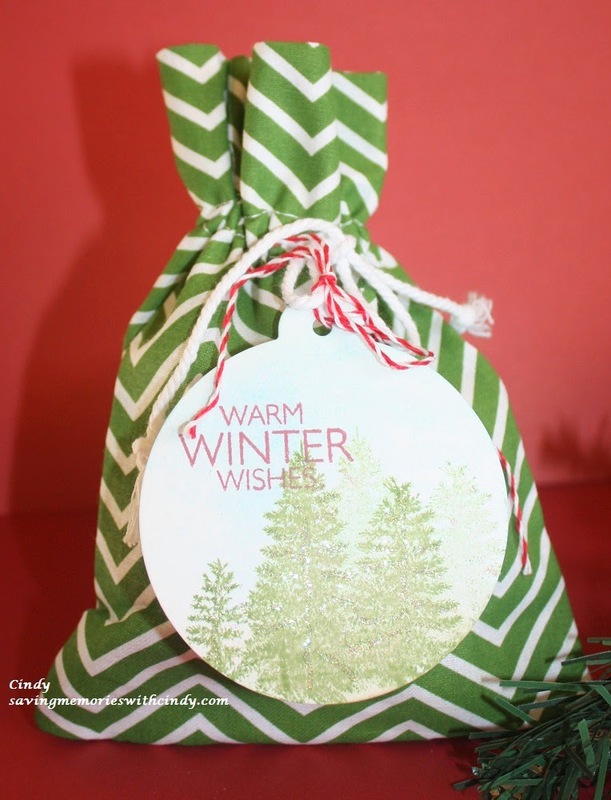 I just love the CTMH Holidays from the Heart Gift Guide! There are papers, kits, WTOG's, washi tape and even an album. I've been playing around with some of the items and want to share them! These are two of the Season's Tweetings Gift Bags (Z1913.) They come in a kit that contains 6 fabric gift bags, 9 tags and a B size stamp set. They are so cute and work up so easily. What fun for office or teacher's gifts. By the way, the images pictured here were colored with my CTMH alcohol markers and had a little Red Glitz Glitter Gel added for an accent. This card is made using the same stamp set that is included in the Gift Bag kit and the Sparkle and Shine paper packet (X7176B.) It also has some washi tape, turquoise dots and prisma glitter. 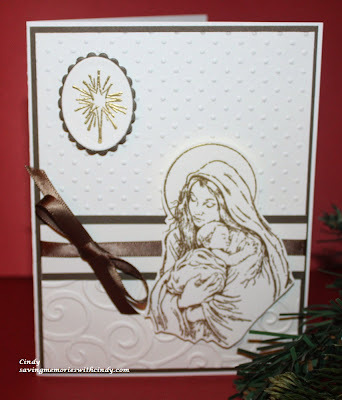 I love the stamp set and being able to also use it for cards or even scrapbook layouts just proves the value in CTMH products. 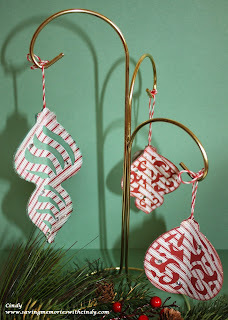 Close To My Heart - Twist Ties! I love this idea. Guess what I'm going to try before I go to work! For Now, Happy Crafting! There has never been a better time to become a CTMH Consultant! 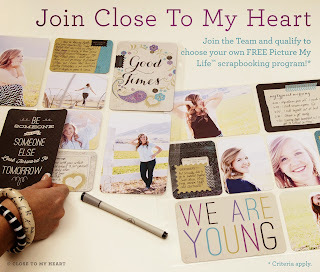 Beginning November 1st through December 15th, if you sign up to be a consultant you can earn Close To My Heart's soon to be released scrapbooking program called "Picture My Life." 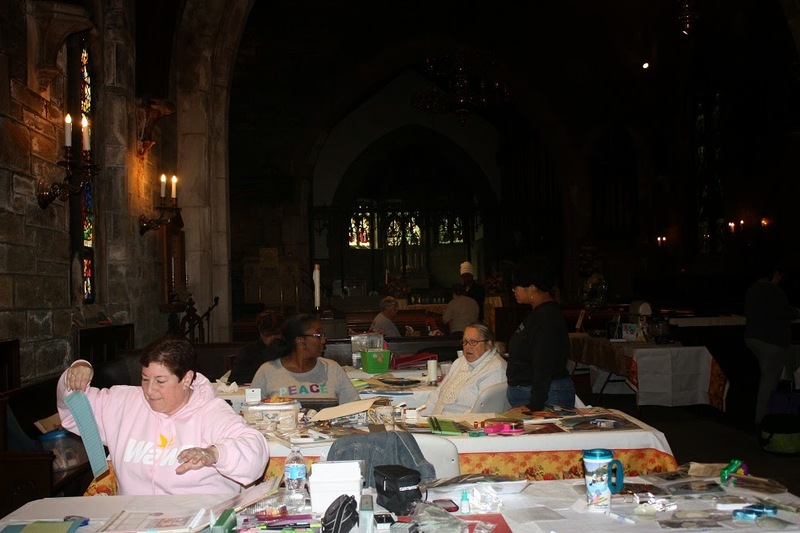 The scrapbooking program features the consistent and well know CTMH quality while adding the ability to preserve those memories in a quick and fun style. When you sign up now, and achieve an easily reachable sales requirement, you will receive the "Picture My Life" kit of your choice right after the 1st of the year for free! The rewards are many. 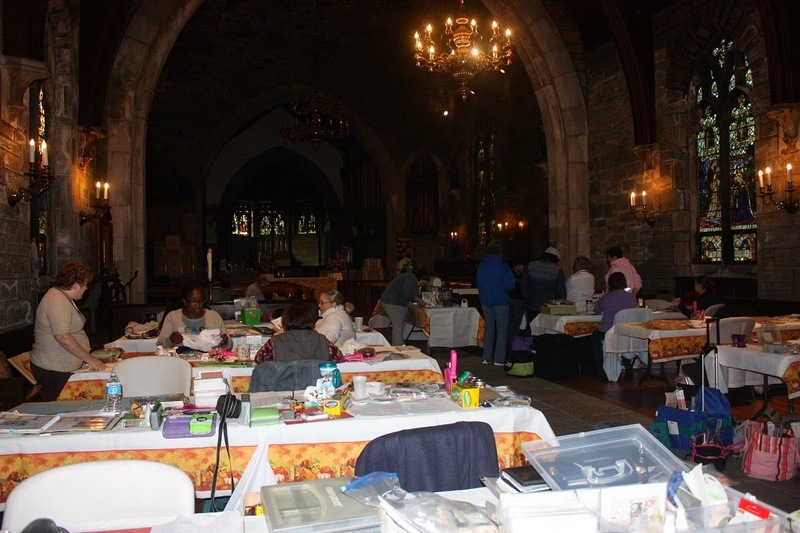 Scrapbooking, card making and home décor projects and supplies that are trendy. Fellowship and fun with a group of consultants that are committed to helping you find and grow your creative spirit. And, a company that is on solid footing, communicates well and provides a great support system for the Consultants. Well, I had my Operation Smile Crop on Saturday, what a success and what fun! 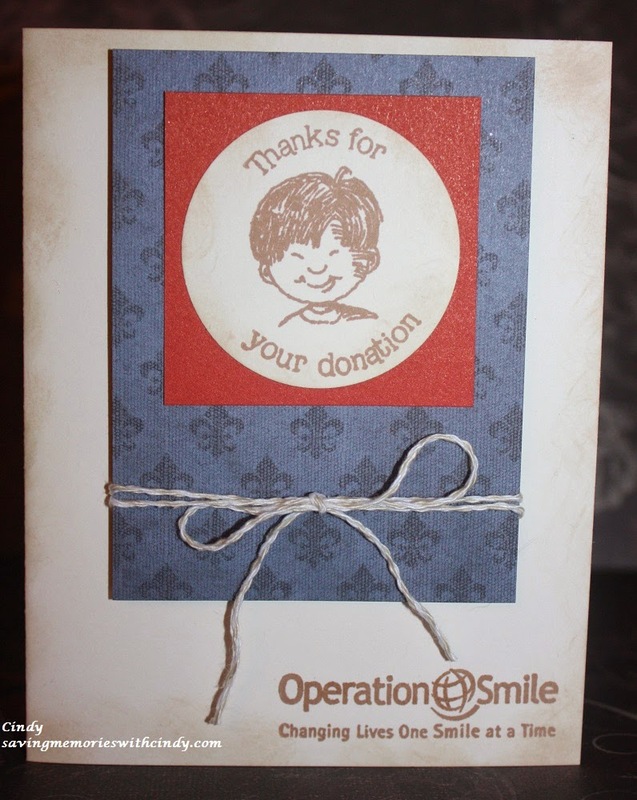 We raised enough money to change the lives of almost 3 children! I am going to let the pictures speak for themselves.... For Now, Happy Crafting!